March 27, 2015 by Ecommerce News. About Statistics with tags Germany, The United Kingdom. 9918 views. Global online sales for women’s luxury fashion are expected to grow from a current 3% of the total market to 17% by 2018. By then, this market would be worth 10.92 billion euros. One of the main drivers of this surge is the exceptional expansion in China, but also the solid market growth in developed, Western markets like the United Kingdom, France and Germany. 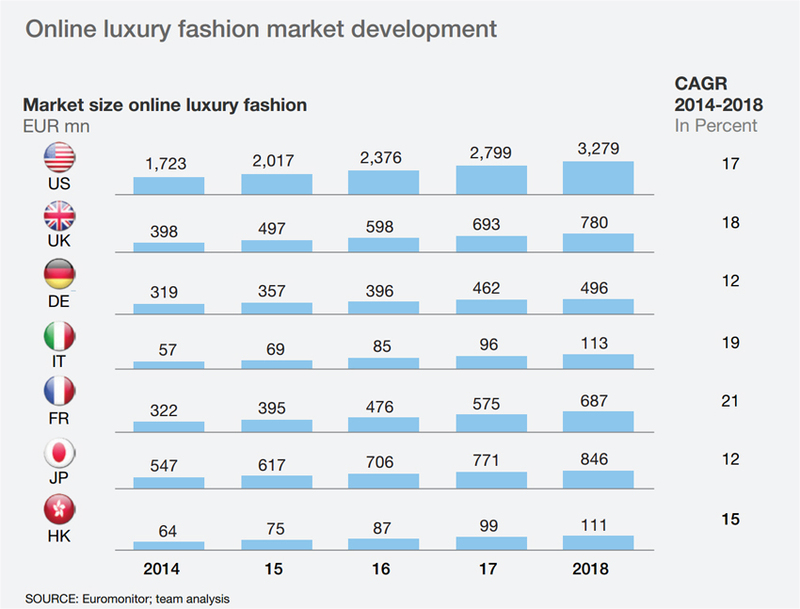 McKinsey & Company published the results of their study, called “The opportunity in online luxury fashion”. It says that after a slow start, luxury fashion has finally earned its place in the digital universe. “Most brands now interact with consumers both through their own branded online store and on multi-brand online retailers.” It also claims that nearly half of luxury goods buying decisions are already influenced by what consumers hear or see online. The American consulting firm also did some predictions concerning the luxury fashion market. It expects the annual online sales growth between now and 2018 to be 21% in France, 18% in the United Kingdom and 12% in Germany. By way of comparison, the predicted growth for the next three years is expected to be 70% in China and 17% in the United States. 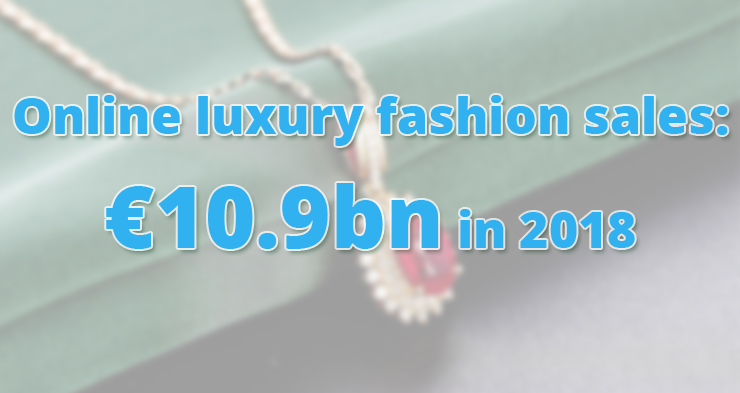 In its study, McKinsey & Company focuses on the most important luxury fashion markets, such as the UK and Germany. The top site for British luxury shoppers is department store Selfridges.com, where 65% of respondents say they have either considered buying or have bought luxury goods. Other popular luxury retailers are Net-a-Porter and Farfetch.com. “In the UK, pure-play online retailers have a bigger role than in the US”, the study claims. During the consumer survey, held in June 2014, respondents were asked to react on several statements. It shows that British shoppers typically go directy to the online shop or use a search engine to find the product they are looking for. 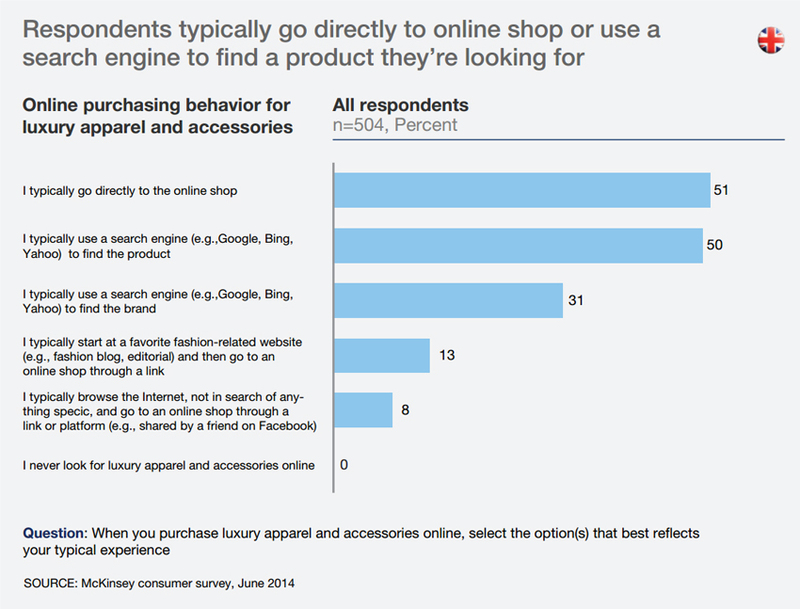 In Germany, brand-owned online stores lead the market, with 57% of luxury consumers saying they shopped at one in 2014. Popular stores are KaDeWe, Net-a-Porter, Mytheresa.com and Stylebop. “German consumers are generally accustomed to a high service level in online retailing, and when it comes to luxury, they are even more demanding and discerning. As a result, they do not have a high level of satisfaction with the luxury fashion sites they frequent most often”, the study concludes. 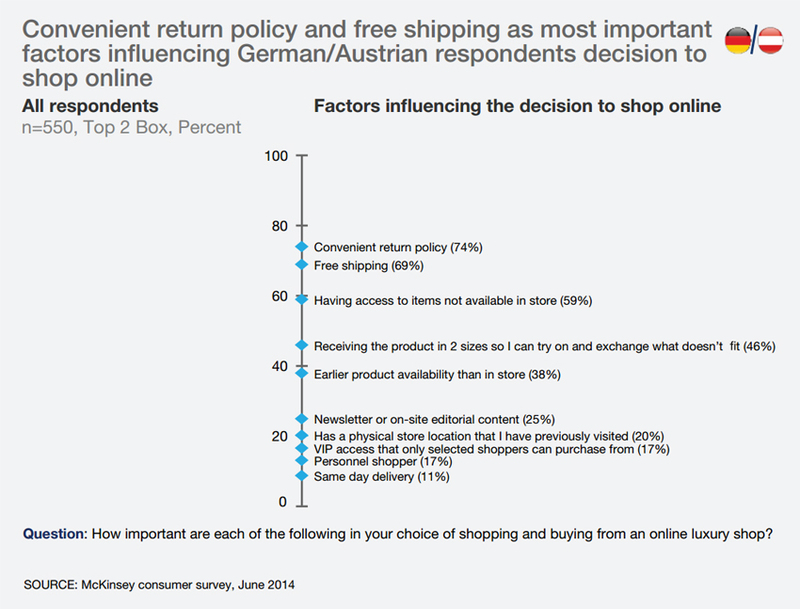 German consumers think a convenient return policy and free shipping are the most important factors that influence their online purchasing. What differs German consumers from online shoppers from other countries is that they specifically value the ability to order a product in two sizes so that they can return the one that doesn’t fit. But is this really a surprise, considering the fact that this is one of the reasons German fashion retailer Zalando became such a success?